he core assumption of the MIME project is that “mobility” and “inclusion” are not incompatible, but that they do not necessarily converge, and that societies (and even individual citizens) are often confronted with a trade-off between them. In general, more mobility may compromise inclusion and cohesion, while a focus on inclusion and cohesion may impair mobility. This assumption will be investigated and evaluated in several of the case studies MIME will produce, and pave the way for the next step in the MIME approach. How can we ease these tensions through well-designed policies? 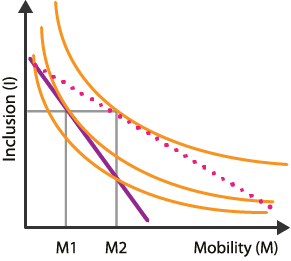 Societies have a number of objectives, among them a certain degree of “inclusion” (I) and “mobility” (M), measured along the axes. The curves, known as “indifference curves,” represent the degree of attainment of these objectives; they symbolise what is “desirable.” In general, more mobility and more inclusion are both considered desirable. The solid straight line summarises social constraints at a given time. More "mobility" may often only be achieved by sacrificing some “inclusion,” and vice-versa. The basic response to this situation is to adopt policies that nudge society along the solid straight line (“the realm of the possible”) so as to reach the highest possible curve (which means achieving society’s objective to the highest degree possible, given the constraint). However, a more ambitious response is to use policies not just find the “best” point along an existing constraint (the solid straight line), but to design policies to relax the constraint and move it outwards (to the dotted straight line). This allows, in this example, to achieve more mobility (M1 < M2) for any given level of inclusion. The MIME project requires the participation of specialists from a wide range of disciplines and, accordingly, an elaborate project design. Our seven work packages are described fully below, and are organised in a precise and systematic fashion, with a clear set of interconnections. These are presented in the rotating figure to the right, which uses the MIME cartwheel in order to highlight the structuring role of policy questions in the project’s overall scientific design, and the centrality of dissemination in the organisation of its work. Work packages 1 through 6 all directly nurture Work package 7, devoted to dissemination, awareness, training and exploitation (“DATE”). 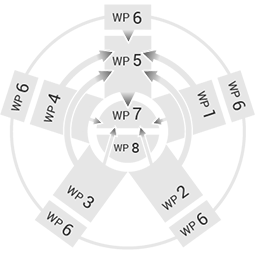 In addition, however, they provide input for the policy perspective in Work package 5, whose function is precisely to offer a meta-level, integrative method to receive theoretical and empirical knowledge developed in the other work packages and process this knowledge for application in policy selection and design – itself constituting an input for “DATE” activities in WP7. draws on SCIPROM’s solid expertise and professional support in the running of large-scale, international multi-partner projects financed by the European Commission in FP4-7, taking the burden of administration off the shoulders of the researchers.